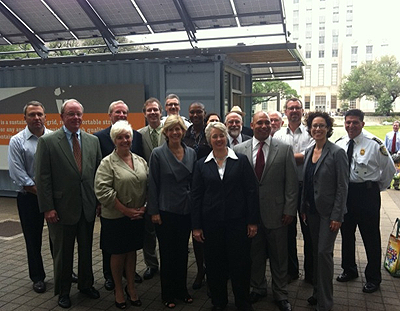 The City of Houston is buying 17 mobile solar-powered units from the University of Houston. The containers will be able to power small appliances and devices during emergency situations or widespread power outages. And as Wendy Siegle reports — the inside of the units are fitted-out to be used for offices, storage, and first aid stations. The units are called SPACE, which stands for Solar Power Adaptive Container for Everyone. Mayor Annise Parker says they’ll be able to generate much needed power in the event of an emergency, such as a hurricane that wipes out the city’s electricity grid. The units will be able to charge critical medical devices and store medicines. She says they would have been helpful in the aftermath of Hurricane Ike. Architects from the University of Houston’s College of Architecture used recycled shipping containers from the Port of Houston to build the solar-powered units. The containers aren’t huge, just 8 feet wide and 20 feet long, but they pack a lot of power. Joe Meppelink is the director of applied research at the College of Architecture. He says each container will have 18 adjustable solar panels which generate 3500 watts of electricity. Meppelink says the number of devices the SPACE units can power depends on how much electricity they need. Each container can also function as a self-sustaining office space. Inside they’re equipped with energy efficient air conditioning systems, cabinets and work spaces. 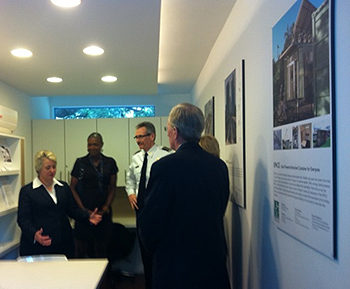 Mayor Parker says that means the units can also be used during non-emergency times. A couple of them are going to the Houston Parks Department. Mayor Parker says the fact that they’re powered by the sun makes it easy to provide air-conditioned shelter for park employees without having to run power lines underground. The city is using federal grant money to buy the SPACE containers, which cost around $60,000 dollars each. They’ll be deployed to schools, fire stations, neighborhood centers, and parks by the time hurricane season arrives.